The third generation Hyundai Verna is all set make its debut in India. We have all the required details of this new sedan as we pit it against the segment leader the Honda City and the Maruti Suzuki Ciaz. Now both the second generation Verna and the Ciaz have briefly managed to steal the crown from Honda, but now the more pertinent question arises, will the Korean manufacturer be able to dethrone Honda for good or will it play second fiddle to both the Japanese carmakers? Even though this segment also features the Volkswagen Group's twins — Volkswagen Vento and Skoda Rapid, but as they are a bit outdated, we decided to skip these two cars. The new Verna is longer and wider than the outgoing model. Therefore, it's safe to say that the third generation sedan's cabin will be roomier as the length's increased from 4,375mm to 4,405mm and width from 1,700mm to 1,729mm. For all travel buffs and those looking for a reason for retail therapy, Hyundai has increased the boot space from 465 litres to 480 litres. This all sounds great but how does it actually fare against the competition. Well for starters, the Honda City is longer as its length is 4,440mm, while the Maruti Suzuki Ciaz has the most spacious cabin as it is 4,490mm in overall length. When it comes to wheelbase, the Ciaz leads the way with 2,650mm, while the City is 2,600mm and new Verna should be slightly shorter. Also, both the Honda and the Maruti Suzuki sedans offer better boot space with identical 510 litres of space. If you are a bit wary that your sedan might scrape over speed breakers then have no fear as the Ciaz boasts a ground clearance of 170mm while the Honda offers 165mm. Unfortunately, at the moment no information has been revealed about the new Verna's ground clearance. 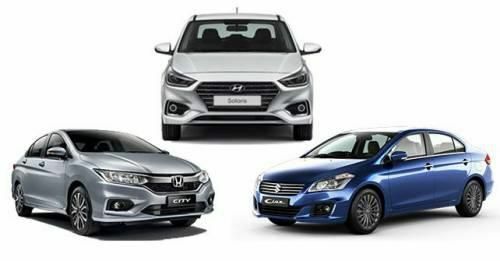 All the three sedans in this comparison offer both petrol and diesel variants, but in the case of the Hyundai Verna, it offers two engine trims — 1.4L and 1.6L – in both the fuel options. Also, all the three cars offer a petrol automatic version. Coming to the new Verna, it retains multiple choices of powertrains from the current sedan like the petrol comes with 105bhp 1396cc engine and 121bhp from the 1596cc motor. While the diesel 1396cc pumps out 89bhp and the 1582cc offers 126bhp of power. The 1596cc petrol automatic version is mated with a new 6-speed torque converter, replacing the old 4-speed one. On the other hand, the City is powered by a 1497cc petrol heart, which has 117bhp of power and is mated to a 5-speed manual gearbox or an automatic CVT. The diesel variant comes with a 99bhp 1498cc motor mated to a 6-speed manual transmission. Both the Maruti Ciaz's engines might be the least powerful ones on paper, but they more than makeup with a linear smooth acceleration. The 91bhp 1373cc petrol engine is mated to a 5-speed manual or a 4-speed automatic transmission while the 1248cc Multijet diesel engine churns out 88bhp and is fitted with a 5-speed manual gearbox. Even though not all the new Hyundai's features are revealed, but the Verna is expected to be fully loaded with a smart touchscreen infotainment system, which will feature both Android Auto and Apple CarPlay. It will also be equipped with projector headlamps along with DRLs like the Honda City. Only the Ciaz, at the moment, doesn't offer DRLs, but a facelift is expected soon. The three sedans come packed with all the bells and whistles as expected, but the City is the only sedan that uses MirrorLink to help sync your smartphone with the music system. It is also the only car that comes with sunroof bragging rights. All the three cars – Verna, City and Ciaz – come fully loaded with safety features like dual airbags along with Anti-lock braking system (ABS) and electronic brake-force distribution (EBD), which are offered as standard features. As expected, being a Honda, the City comes at a premium. The petrol range is from Rs 8.46 lakh to Rs 13.37 lakh, ex-showroom Delhi. While the diesel is from Rs 10.68 lakh to Rs 13.43 lakh, ex-showroom Delhi. The Ciaz, on the other hand, is still the more affordable option even after the implementation of GST. The petrol range is from Rs 7.65 lakh to Rs 10.41 lakh, ex-showroom Delhi, while the diesel is Rs 9.42 lakh to Rs 11.44 lakh, ex-showroom Delhi. Based on the outgoing Verna's prices, the new generation version should be priced in-between the Ciaz and City.